Two types of stringed keyboard instrument were available to the household or court musician from the 16th century to the middle of the 18th: the harpsichord and its near relations, the spinet and virginal; and the clavichord. 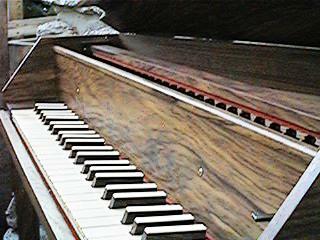 In the harpsichord family the string is plucked by a small plectrum, originally of quill. The variety of sound from these plucked instruments is achieved not primarily by finger pressure, but more subtly by phrasing and articulation. Variety of tonal color can be obtained, on a harpsichord by judicious choice of registration. The harpsichord was used both for solo performance and accompanying in chamber groups and in larger ensembles of the period. It typically had two sets of strings per key, tuned either to the same pitch or with one set sounding an octave higher (a 4' register). The registers were controlled by hand stops above the keyboard. Two manuals (keyboards) were to be found on certain larger instruments, which usually featured three sets of strings. Found from the beginning of the 16th century, the Italian harpsichords were lightly constructed, almost invariably finished in natural wood. They usually had a single manual and a basic registration of two 8' stops which were often used together, although a 4' stop was occasionally an option. They have a characteristically pungent, immediate, almost at times percussive tone which is well suited to 17th century Italian music. The other main type of harpsichord in use from the early 17th century was the Flemish style instrument, and it is the name of the Ruckers family that is most associated with this influential tradition. Flemish instruments were more solidly constructed than the Italian, invariably with the basic two sets of strings (either one 8' and a 4' or both at 8' pitch). Two manuals were common, though the upper manual was originally used for transposing; only in the second half of the 17th century was the additional manual used for contrast of tone with the ability to couple the registers of both manuals for a fuller sound. The Flemish often painted their instruments, decorative lids and soundboards being common features. French instruments developed from the Flemish design. Many so-called French harpsichords were in fact Flemish in origin, rebuilt by French makers who increased the compass in both treble and bass. English harpsichords, in contrast, had a directness and down-to-earth quality both in appearance and sonority with a characteristically powerful tone, a reedy treble and a sonorous bass. Of polished veneered wood, with a straight, plain design, they could equally have one or two manuals. In general terms the harpsichord as a solo instrument was perhaps less popular in Germany than in France or England. 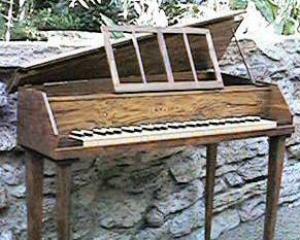 The spinet is a smaller, domestic harpsichord normally with one string per note. Having a shorter string length, the strings often run diagonally from the keyboard in order to save space. The virginal (or virginals, the plural being equally correct) also has one string per note but here these run parallel to the keyboard. This useful domestic instrument was more popular than the harpsichord in northern Europe (particularly in England and the Low Countries) in the late 16th and early 17th centuries. Instruments on the clavichord principle were known in the fourteenth century and appeared to have been popular throughout Europe. By the 16th century it was little used in England and the Low Countries, although many examples can be found in Spain, Italy and Germany. Two strings per note, set closely together so that the tangent played both in unison was established as a general principle. 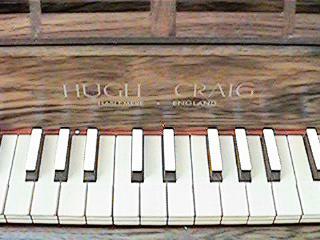 There are early examples of fretted clavichords, where the tangents of adjacent keys hit one double string at the appropriate point.